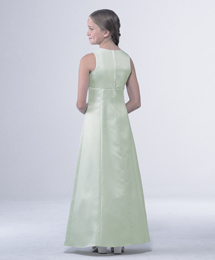 Description: Sleeveless "Avanti Satin" princess line dress has empire waistline and jewel neckline. Available as an Express Style. Accessories: Coordinates with Silhouettes Bridesmaid WD7OB.